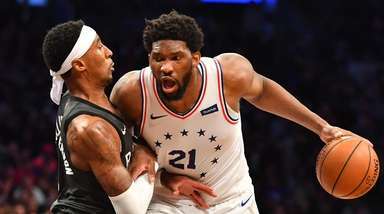 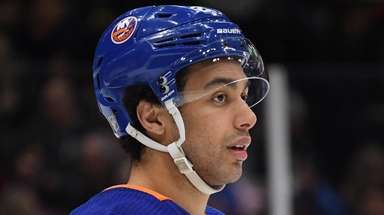 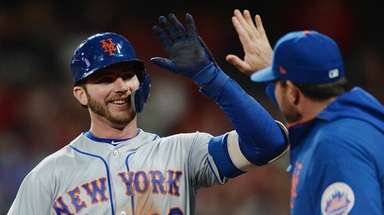 The Islanders played the Ottawa Senators on Thursday, March 7, 2019, at the Canadian Tire Centre in Ottawa. 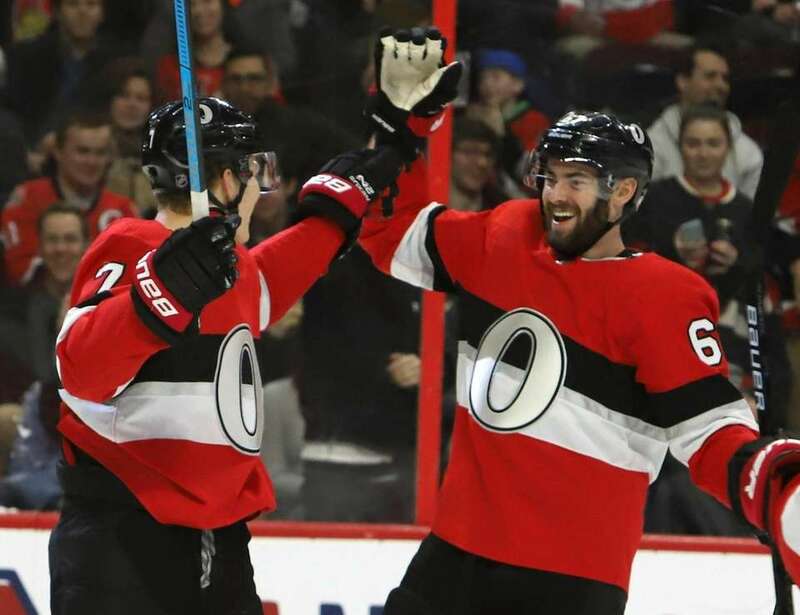 Ottawa Senators left wing Brady Tkachuk celebrates his goal against the New York Islanders with defenseman Ben Harpur during first-period NHL game action in Ottawa, Ontario, Friday, March 7, 2019. 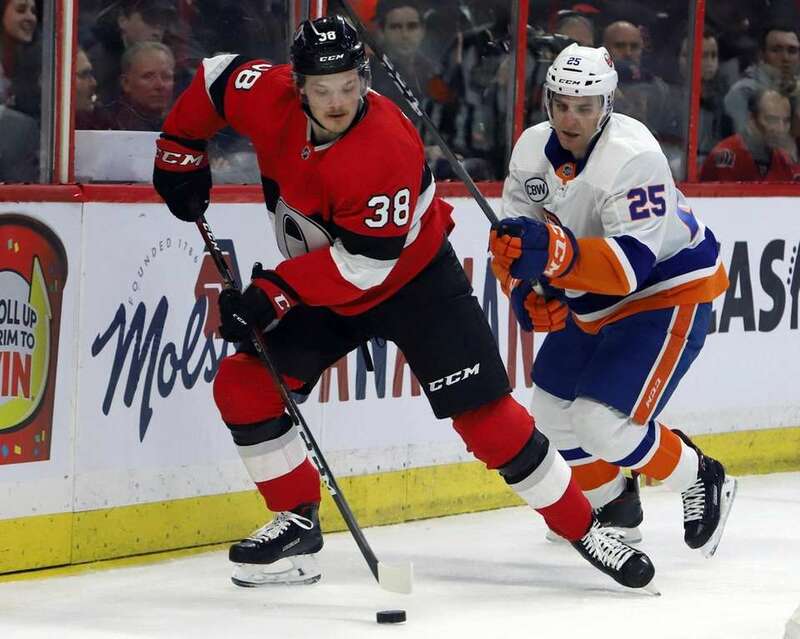 Ottawa Senators left wing Rudolfs Balcers controls the puck along the boards as New York Islanders defenseman Scott Mayfield defends during first-period NHL game action in Ottawa, Ontario, Thursday, March 7, 2019. 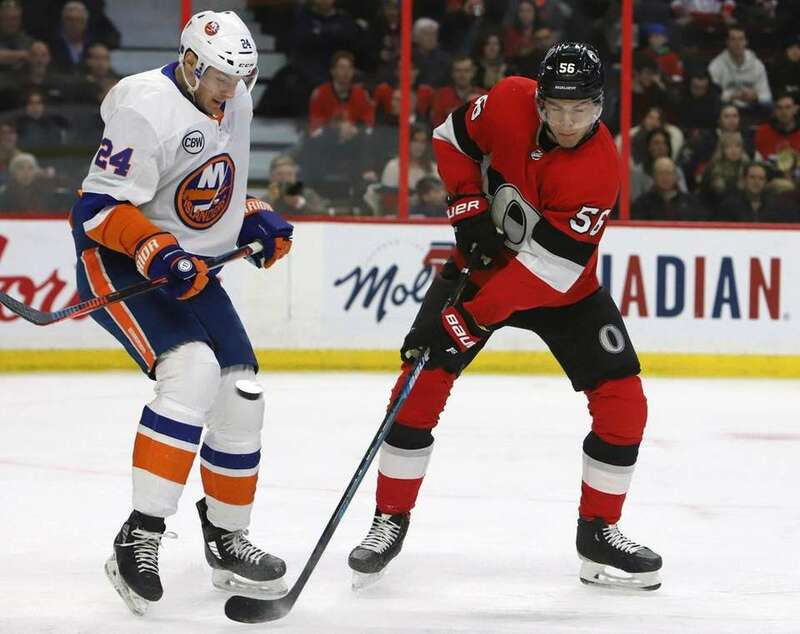 New York Islanders defenceman Scott Mayfield blocks a shot as Ottawa Senators left wing Magnus Paajarvi looks on during first-period NHL game action in Ottawa, Ontario, Thursday, March 7, 2019. 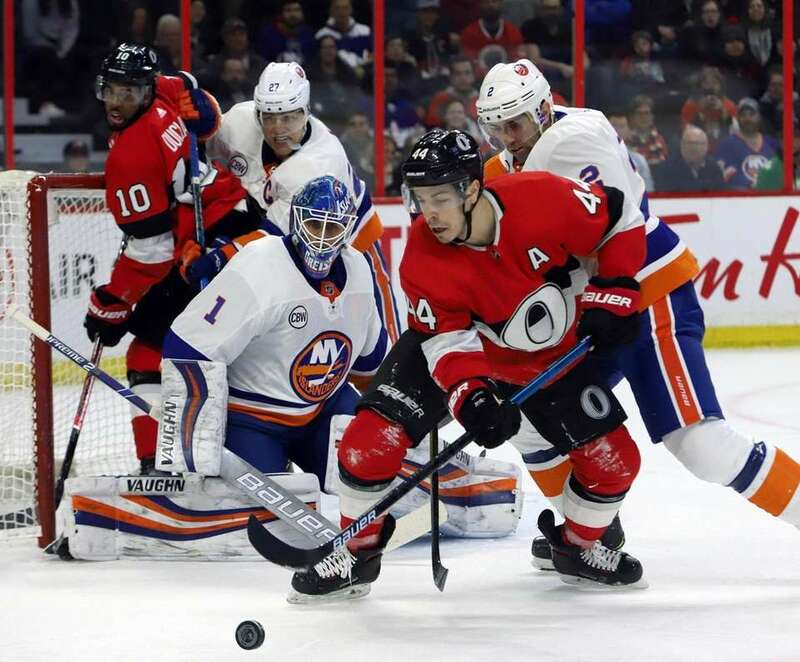 Ottawa Senators center Jean-Gabriel Pageau tries to control the puck in front of New York Islanders goaltender Thomas Greiss as Islanders defenseman Nick Leddy defends during first-period NHL game action in Ottawa, Ontario, Thursday, March 7, 2019. 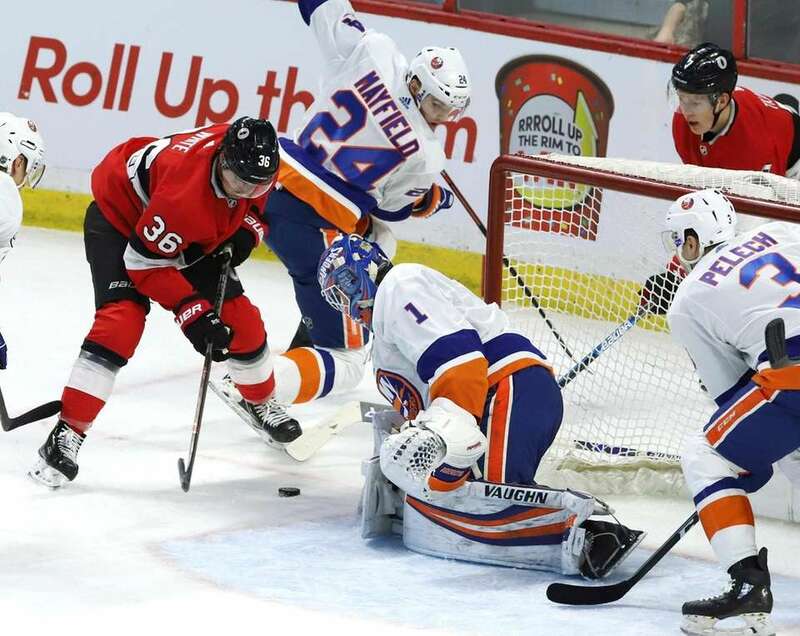 Ottawa Senators left wing Brady Tkachuk celebrates his goal against the New York Islanders during first-period NHL game action in Ottawa, Ontario, Thursday, March 7, 2019. 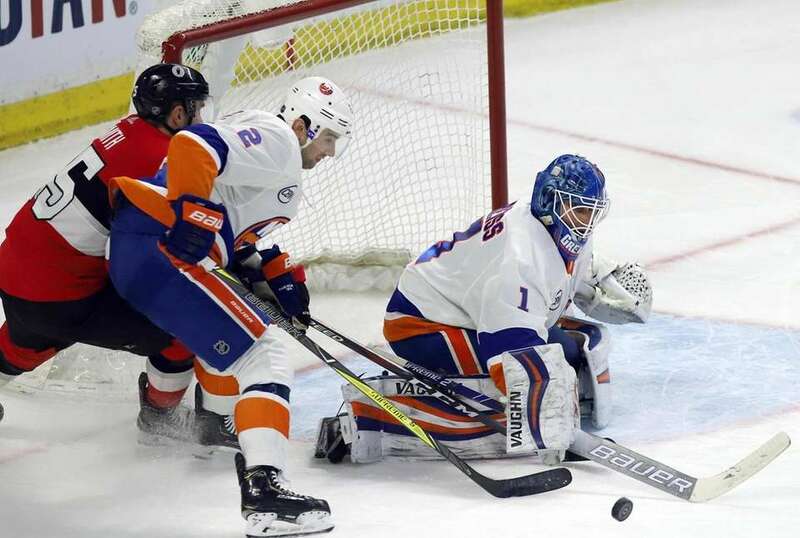 Ottawa Senators goaltender Anders Nilsson makes a save as New York Islanders right wing Tom Kuhnhackl looks for a rebound during second-period NHL game action in Ottawa, Ontario, Thursday, March 7, 2019. 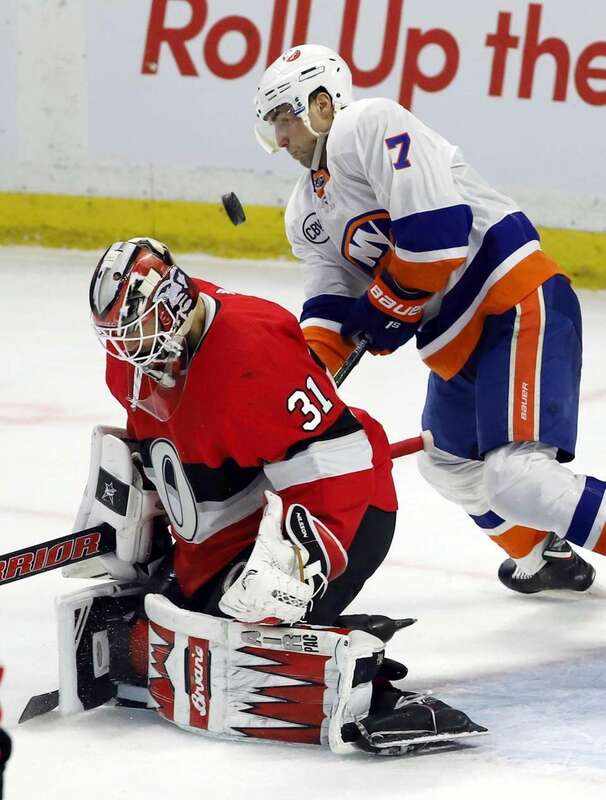 Ottawa Senators center Colin White and New York Islanders goaltender Thomas Greiss look at the puck during second-period NHL game action in Ottawa, Ontario, Thursday, March 7, 2019. 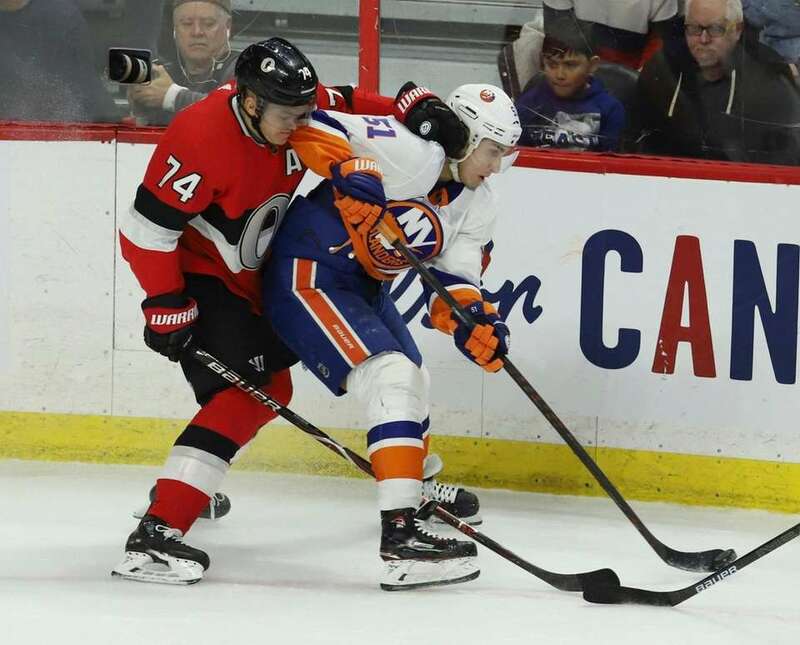 Ottawa Senators defenseman Mark Borowiecki and New York Islanders center Valtteri Filppula battle for the puck during second-period NHL game action in Ottawa, Ontario, Thursday, March 7, 2019. 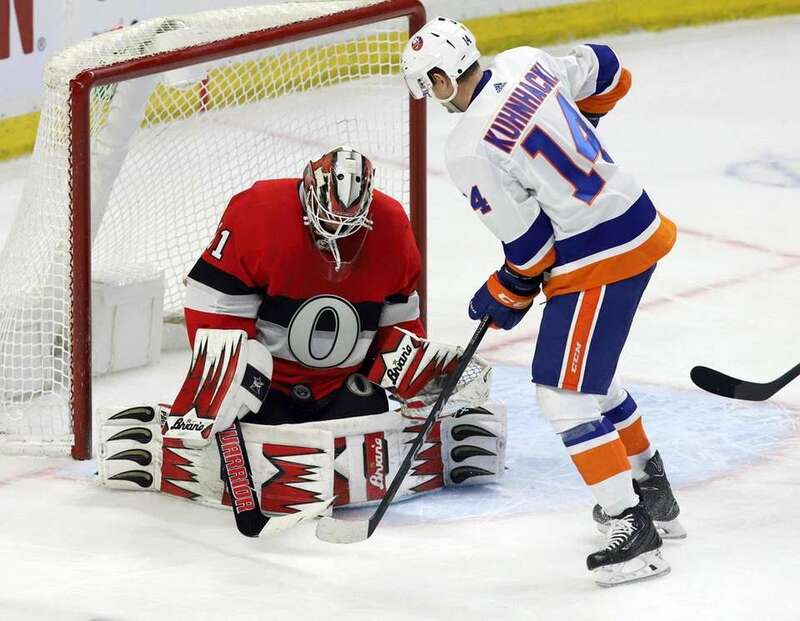 Ottawa Senators goaltender Anders Nilsson covers the puck as Ottawa Senators defenseman Christian Wolanin and New York Islanders center Valtteri Filppula battle during second-period NHL game action in Ottawa, Ontario, Thursday, March 7, 2019. 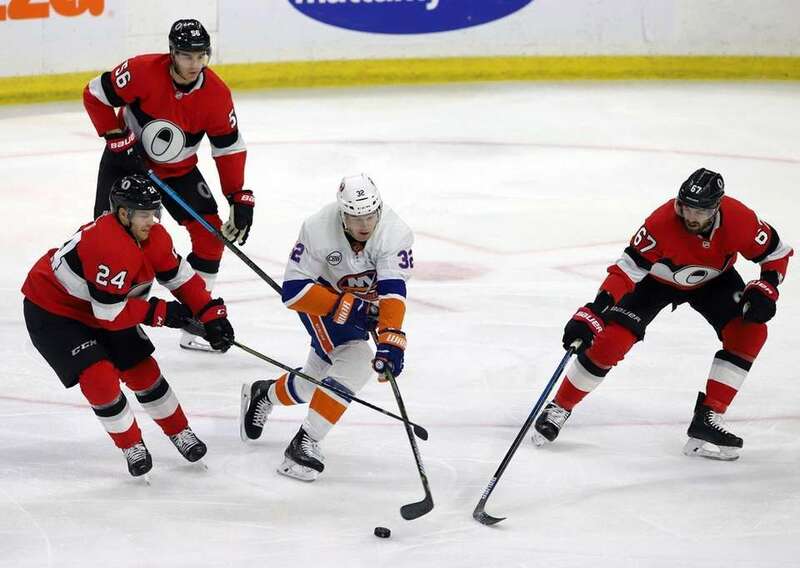 New York Islanders left wing Ross Johnston skates between Ottawa Senators left wing Oscar Lindberg and defenseman Ben Harpur during third-period NHL game action in Ottawa, Ontario, Thursday, March 7, 2019. 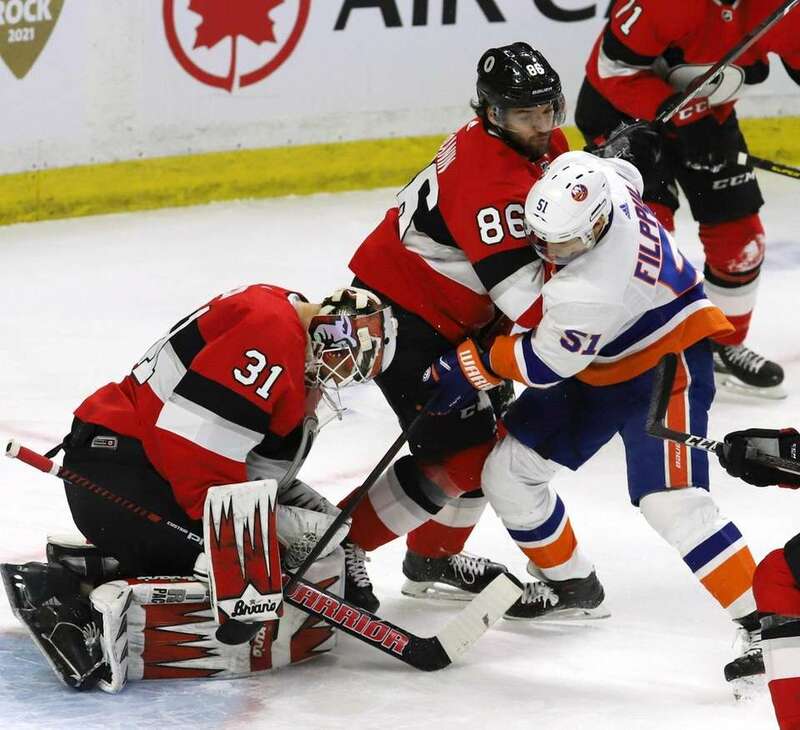 New York Islanders defenseman Nick Leddy and Ottawa Senators left wing Zack Smith battle for a rebound in front of Islanders goaltender Thomas Greiss during third-period NHL game action in Ottawa, Ontario, Thursday, March 7, 2019. 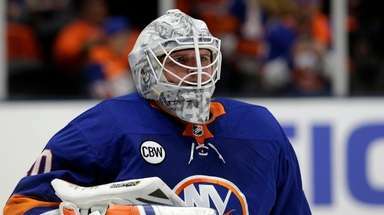 The puck gets behind Ottawa Senators goaltender Anders Nilsson as New York Islanders right wing Jordan Eberle tries to control it during third-period NHL game action in Ottawa, Ontario, Thursday, March 7, 2019. 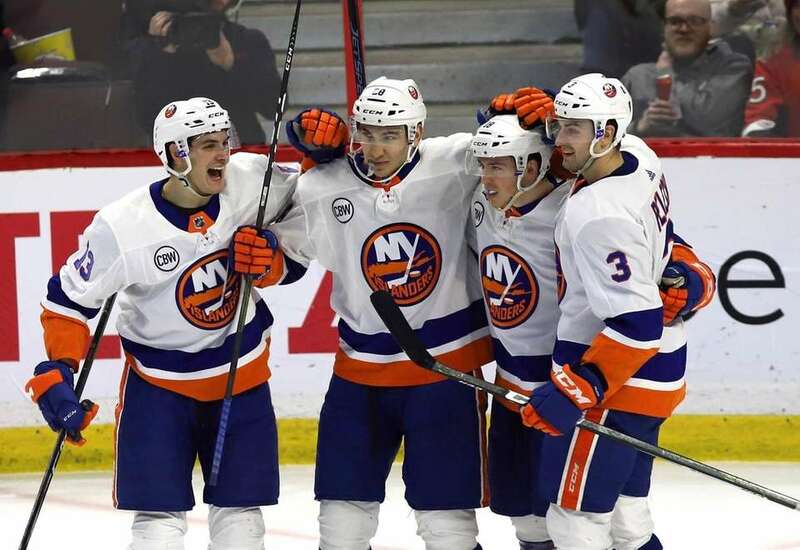 New York Islanders left wing Anthony Beauvillier celebrates his goal against the Ottawa Senators with teammates Mathew Barzal, Michael Dal Colle and Adam Pelech during third-period NHL game action in Ottawa, Ontario, Thursday, March 7, 2019.